they released a mac version of the software. thats a big one. the mac version doesnt yet support the gps overlays, but its a really good sign. i didnt even think that was on their roadmap. they also came out with new accessories, and they released a firmware update that lets you flip the video 180 so you can mount it upside down. that shows good effort and output on their part. i found it on a great deal on cyber monday and picked it up. it just came today. im trying out two mounts. instead of mounting to my helmet or to my side case like i did last month, this time i got a handle bar mount, and a suction cup mount. 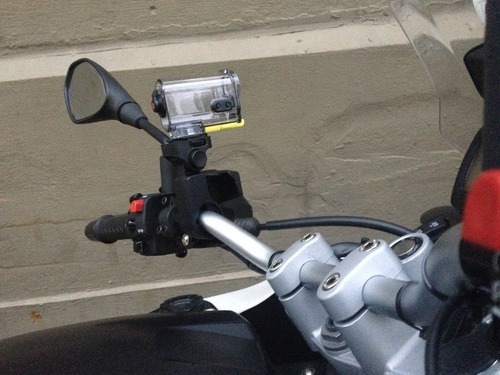 for the suction cup, i didnt find many flat surfaces that worked well on my bike except for my windshield.. which i think might be too funny to use. 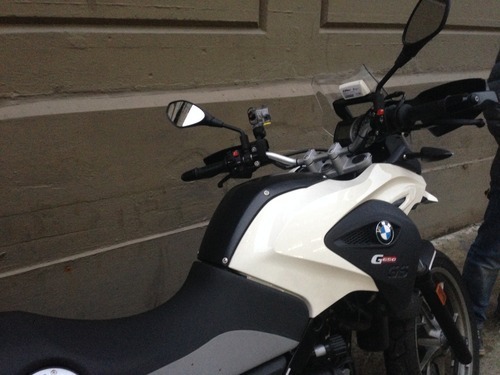 i think i like the handlebar mount. it feels more secure, and i can just leave the mount with the water proof case on my bike all the time, while just removing the camera. 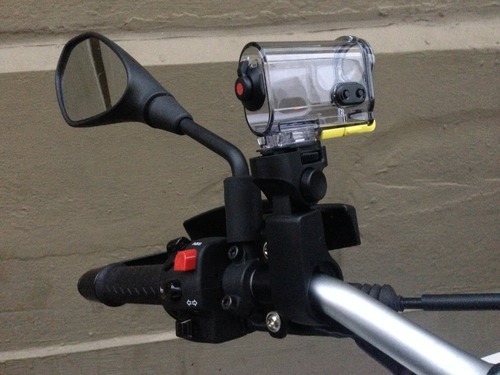 i like the positioning on the handlebar, i can see the record light when its on, and i can easily start and stop recording with my left hand. Edit: scroll to bottom for best footage. here’s a 3 minute clip i shot at night on the belt parkway. 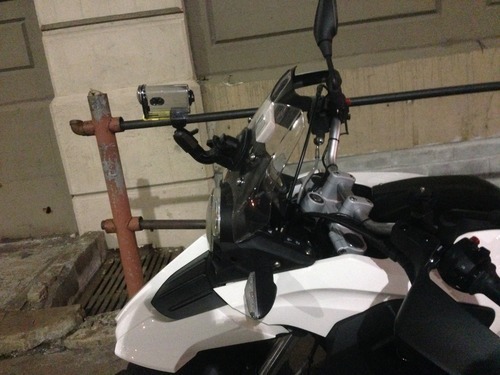 i think the main issue is that its focusing on the windshield. overall though im happy with the night quality. i dont need it to be perfect at night, its more just to document any major occurrences. its the day time clarity i care about more. i took some day time video today and noticed that the mount is moving slightly and distorting the picture. 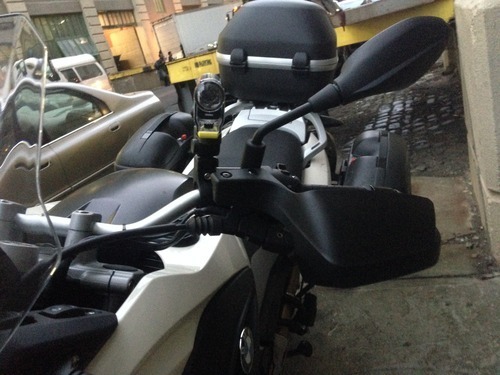 after i got back to my office i added some more padding between the mount and the handlebar. it seems more solid now but i wont know until tomorrows daytime recording to compare it to. here’s a quick clip of the daytime run on the FDR, entering from 23rd st.
a little video at night, this time with tightened mount, and with wide angle set (170 instead of 120) so you can see tach and speedo. it was a bit wet out. the latter half of my ride home was misting harder, and the camera became fairly useless at that point. 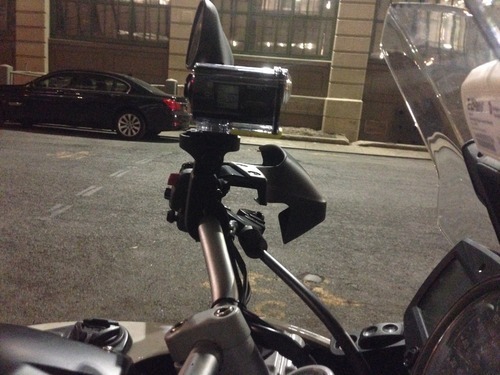 ill add my last video to this post tomorrow with some more daytime riding with the tightened mount. i know its going to be drizzling all day tomorrow so we’ll see how it comes out. Ok. Here’s some good daytime footage, most of it played back in high speed.